Yesterday I was assigned to send a postcard to the #1 poscrosser in the USA (at least right now), motherbrando. She has sent nearly 4000 postcards in her 6 years on Postcrossing. 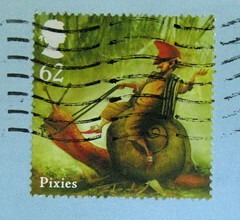 (I've also been on Postcrossing for more than 6 years, but I've only sent a little more than 700!) Gulp. She has a very full profile and seems like an interesting person. I chose a books/reading postcard shown above: "Lesebuebchen" (little boy reading) by Martina Hoffmann, from bizarrverlag.com, though I purchased mine in a bookstore somewhere. I hope she enjoys the postcard! That's a really cute postcard. I bet she will enjoy it! Wow, this is the coolest postcard! Thanks for the positive feedback! PostMuse, I thought you were the top sender there for a while. How lovely that you two exchange postcards - and I happened to write her a very full postcard with tiny writing filling the space, so I'm glad she employs the same practice! Wow, almost 4000 sent cards! That's very impressive. After reading Renee's fun profile, it looks like you made a perfect card choice for her. What a lovely postcard--well chosen and charming! 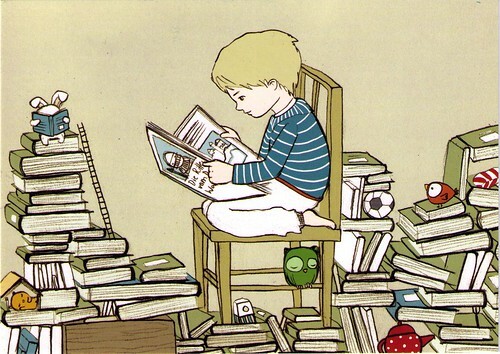 Aah, reminds me of the happiest times of my childhood - those spent lost in books! I wanted to share with you my most recent blog post, as I have photographed some vintage stationery treasures from my collection.